The latest Job Vacancy Survey (JVS) brings good news to Minnesota job seekers. While job vacancies have been showing labor market recovery for a while, the latest survey shows a total of 88,900 job vacancies across the state. This is an increase of 47.3% from a year ago and the highest number of job vacancies in 14 years. The Job Vacancy Survey (JVS) is conducted twice a year by the Minnesota Department of Employment and Economic Development (DEED). It provides job seekers with information about the number and types of jobs available in Minnesota regions as well as wage information for those jobs. To learn how the survey is conducted read Featuring the JVS. The table below shows the occupations with the top numbers of vacancies across the state. It also includes the percent of those vacancies that require post-secondary education or a certificate or license as well as the median wage offer reported by employers. Learn more about each occupation by selecting the Occupation Title in the table. Find more data from the latest survey: Top 15 Minnesota Job Vacancies. 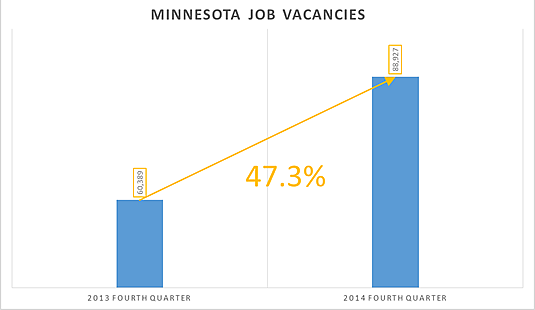 Source: Minnesota Job Vacancy Survey, 4th Quarter 2014, Minnesota Department of Employment and Economic Development. Understanding which vacancies are available in a specific region can help you in your job search. You can use the Job Vacancy Survey data tool on DEED’s website to find and compare vacancies across different regions. You can search by Occupation, Industry, or Firm Size. You can also limit your search to only part-time or full-time vacancies. Interested in more information about the number and types of vacancies across the state as well as the types of education and experience these vacancies require? Check out Minnesota Job Vacancy Key Findings. Joy Brown is the Webmaster for ISEEK.